My colleague - Rob Nocera, will deliver a Web session about Client/Server Forms modernization to ADF 11g on Wednesday, November 12, 2008, 11:00 AM ET. You can register and check event agenda on this page. This event will be interesting for all Oracle Forms customers, who are investigating their current software infrastructure modernization ways. Rob will talk not only about ADF 11g technical aspects, he also will describe what parts of Oracle Forms functionality can be mapped to ADF and what parts can't. If you are Oracle Developer, and live in Latvia, you can register to attend Oracle Forms: The Road to SOA workshop in Riga city on October 28th. I will be happy to share and discuss my experience in Oracle Forms modernization I'm doing with JDeveloper/ADF 11g and Oracle Fusion Middleware. It can be that topic for current blog post looks very basic, however I will describe one simple thing that can make your development life easier. I will explain how to use Method Call in ADF Task Flow in order to open called form in Find mode, without using invokeAction in Page Definition. How often you develop forms, where one of key requirements is to open form in Find mode. From my experience, it is quite common behavior. However, usually it is not enough just to define invokeAction in Page Definition and execute Find action each time when page is opened (postback == false). For example, form can be opened in Find mode from main menu, but it should be opened in Edit mode, when is called from separate specific form. In such case, JDeveloper/ADF 10.1.3 developer will create parameters and evaluate through expression language in invokeAction. This approach works, however as always there is a better approach. This better approach is to use ADF Task Flow functionality available in JDeveloper/ADF 11g. In ADF Task Flow its possible to define Method Calls and separate action logic with page logic. Please, read ADF Developer Guide 11g, in order to get more information about ADF Task Flows. You can download sample application I have developed - FindMethod.zip. This application is based on standard HR schema from Oracle and implements two pages - index.jspx and main.jspx. First page is defined in unbounded ADF Task Flow and calls second page from bounded ADF Task Flow. 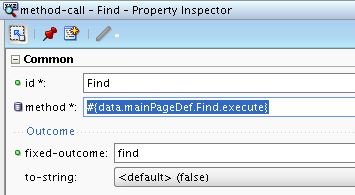 Second page is opening in Find mode automatically, without invokeAction in Page Definition. You can see that as default activity is selected Find Method Call. Idea is - when bounded ADF Task Flow will be opened, default Find activity will trigger and will set iterator to Find mode. Sounds simple, however in practice is little bit more complex. 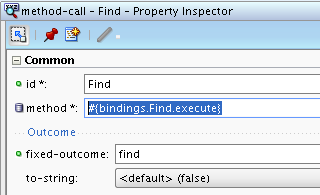 If you will just drag and drop Find action from Data Control and define it as a default activity, it will not work - separate Page Definition file for Method Call will be generated, and Find action will be invoked not for iterator available in main.jpx Page Definition file, but for iterator available in Page Definition associated with Method Call - means Form will not be opened in Find mode. Just to summarize, ADF Task Flow functionality - Method Call, in this case allows to put form to Find mode automatically when bounded ADF Task Flow is opened. All the other pages inside bounded ADF Task Flow can open the same form without invoking Method Call, what gives higher flexibility. 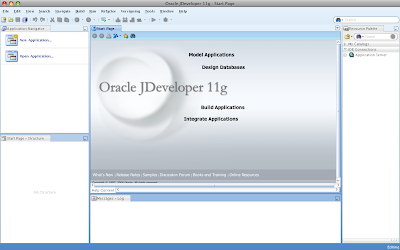 Everyone who is interested in Oracle Fusion Middleware probably knows, JDeveloper 11g is production now. And its possible to install it on Mac OS as well. On Windows, installation process is more straightforward, however it is relatively easy on Mac OS also - just you will need to follow a couple of configuration steps. In this post I will give instructions, I was following in order to install JDeveloper 11g on my MacBook Pro, I will concentrate on those instructions not mentioned in installation guide. 1) Download jdevstudio11110install.jar from OTN download page. It is a base install, without JDK 6. 2) Go to Oracle Fusion Middleware Installation Guide for Oracle JDeveloper on OTN and follow listed instructions. 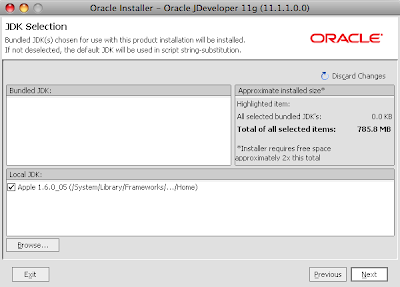 4) However, if you will run JDeveloper 11g installer at this step, you still will not be able to install successfully. In my case, installer wasn't able to find Java Home, even if I was providing it directly. I have solved this, when I have found a section about Known Issues for installing JDeveloper 11g on Mac OS in Release Notes document. During OOW 2008 I have attended Steve Muench talk about new features in ADF Business Components available in 11g release - Oracle ADF: New Declarative Validation, LOV, Search, and Services Features. Those features will be available in Production release, announced to appear this month. However, Oracle ACE Directors already have access to production release candidate - JDeveloper 11g Release Candidate for ACE Directors, so I'm able to test those new features. Very imporant new feature for me - possibility to define multiple LOV's per one attribute. Previously it was possible to have only one LOV defined in Model layer per attribute. In this post I will describe how it works, based on mentioned Steve Muench presentation, and will publish sample application I have developed - LOV_Multiple.zip. You will not be able to run this sample in TP4, only in production when it will be available (I hope very soon).